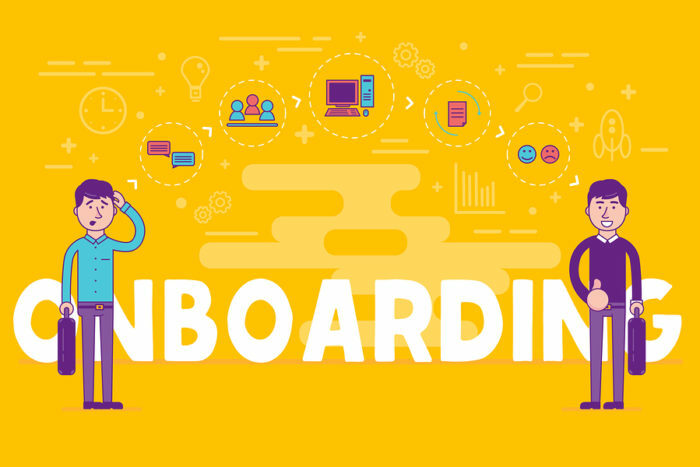 The onboarding process is often a disjointed set of events that is partially owned by different areas of HR and the business, leaving the new employee feeling discouraged and frustrated. With partial-process owners across talent acquisition, HR business partners, HRIS and sometimes a dedicated onboarding department, it can be difficult to determine where to invest in fixing the process. Recent investments have looked to impact the fact that 50% of the American workforce would change jobs if something more compelling came along. These investments are focused on the first experience of the candidate as they transition to employee and while they have included technology, they have not used an iterative design-thinking approach to create the customer-grade experience that is expected. Applying design thinking to the onboarding process involves taking the time to define and observe new hires, understand their needs and ways to improve the experiences most important to them, and prototyping, testing, and refining changes to the overall onboarding process through small pilot initiatives. Consumer grade experiences are required where employees expect to be treated like a customer. Organizations realize this change, and invest in technology and teams to support the candidate experience during the recruitment process. But this focus often stops after the candidate accepts an offer leaving the onboarding process untouched. Providing an exceptional onboarding experience that is enabled by digital technology is critical to new hire engagement and retention. The following are ways to create a highly impactful onboarding experience that sets new hires up for success without overwhelming the HR department. 1. Establish engagement and expectations. The customer-grade experience that new hires demand means they want to connect to people and have a clear understanding of what’s required of them in order to integrate into the organization quickly. New hires want engagement, access to information and communication above all else. Providing early access to team members and establishing a well-managed buddy program where new hires are partnered with an engaged employee familiar with the role being filled and department are two ways to give new hires platforms to ask questions and learn about the experiences of their fellow employees, allowing them to quickly understand the organization, establish goals, and be productive. For example, by providing quick answers to the cultural nuances of the organization, background on their specific department, and the performance management process, a buddy enables the new hire to understand what they need to accomplish and thus focus on productivity and setting meaningful goals. Both the engagement and expectation definition are mutually beneficial for both the new hire and the organization. With the focus on productivity, organizations can reduce the ramp-up time required to get started in a new role and provide the employee a new level of information prior to day one that promotes this experience. 2. Go beyond the transactional. By now most major HR technology providers offer automated transactional onboarding tasks, and 63% of organizations have new hires completing required paperwork and signing off on company policies online. Not only could this administrative interaction be potentially insufficient for new hires, but a poorly executed transactional process that creates obstacles such as internet platform restrictions and requiring printer access can cause the new hire a great deal of stress before day one, already putting their perception of the organization at risk. Completing these tasks must be seamless and straightforward to the new hire as this first experience will set the tone for all other interactions. Customizing the experience allows the new hire to complete job-specific discovery and training immediately, and makes them feel like they are doing work that will contribute directly to their productivity, allowing them to make an impact on day one. 3. Map the one-year journey. Learning the job-specific nuances of a new role, getting accustomed to the culture, completing critical compliance requirements, and adjusting to different technologies takes time. Onboarding programs at large organizations should consider outlining expectations in all of these areas for new hires over the course of approximately one year in order to ensure new hires are assimilating on schedule and continuing to increase productivity. The program would include a comprehensive checklist of activates for the new hire to complete throughout the year, regular onboarding activities such as compliance and technology training through the new hire’s first few months and then monthly check-ins with new hires throughout the remainder of the year to answer questions, follow up on training, and discuss upcoming milestones for the topics listed above. Few companies extend onboarding past the first six months. While the management of a year-long, customized onboarding program may seem daunting, using design-thinking to approach program design and the use of digital technology to support the program can provide new hires a comprehensive, worthwhile and customized experience that allows employees to become more productive quicker. 4. Use design thinking to identify the important. To provide the customer-centric experience new hires are seeking, the first step is to identify who they are. Past experience, location and level are just a few examples of how new hires differ from one another. Once the new hires are properly defined and understood, it is critical to identify the moments that matter to them, not to HR, throughout the onboarding process. For example, a recent graduate is likely to be most concerned about setting goals and clearly understanding their roles, while a professional with 15 years of experience and a family will be focused on registering for benefits and learning new technology required to do their job. Mapping the needs of each new hire persona allows for prioritization of resources for the design of the onboarding experience, the process to support it and the digital technology that allows it all to come together. To illustrate this point, if an organization plans to hire a large number of people relocating to the area, relocation services would be a high priority and budget would be allocated accordingly. 5. How digital technology can help. Fortunately for HR departments, a well-executed digital platform can create an on-boarding experience that leaves an impactful impression without demanding a large team to manage it. When integrated properly to the broader talent management system, information is shared easily and back-office tasks are managed according to the new hire’s completion of critical tasks. Much of this experience needs to be automated, providing a coherent process for the new joiner to navigate, but it is also imperative to have connections to people as well. Digital platforms can manage buddy programs, allow for online chats with HR, host or link to employee resource, and offer directories of employees for easier networking. Using technology to manage the communications also allows program managers to have oversight into how existing employees are playing a role in onboarding new team members. This two-way relationship is so critical to retention that 46% of employees say work friendships play a role in their overall happiness, and that rises to 57% for millennials. New hire expectations have changed. Digital technology has evolved to support these expectations. At an average cost per hire of $4,000, onboarding is too important to be overlooked. When developed with a “new hire first” focus and supported by the right technology, onboarding programs can make a lasting positive first impression that will impact both the organization and its customers. Michael Gretczko is a principal at Deloitte Consulting LLP and General Manager of ConnectMe which delivers a modern solution for the digital workplace. ConnectMe simplifies HR interactions and connects employees how and when they want. Michael has over 16 years of experience in business transformation and focuses on helping clients fundamentally change how they operate.